BRILLIANTLY EASY TO INSTALL, ENDLESSLY USEFUL! Say hello to iMETOS LoRAIN! Weiz, Austria – Pessl Instruments is excited to announce the launch of a new class of weather station. 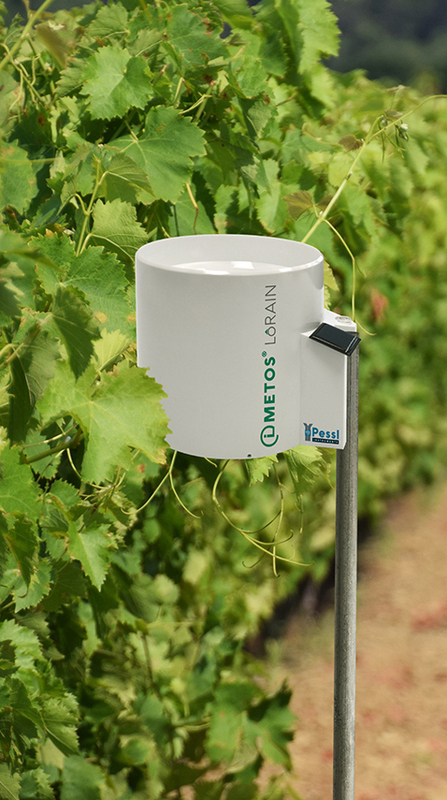 The iMETOS LoRAIN, with real time measurement in your own field for rain, temperature and relative humidity, is the most essential sensor set for your farm operation. This affordable precision farming equipment is compact and easy to use. The official launch of iMETOS LoRAIN will happen on the 25th of February 2019 at the SIMA fair in Paris, France. iMETOS LoRAIN was developed with 35 years of experience and we are confident to say that with this station in your field, you will never miss the spray window, overuse the fertilizer or let the disease take control of your field again. The station measures the most essential weather parameters (temperature, relative humidity and rainfall), calculates many more with the help of 8 virtual sensors and as a result becomes an indispensable decision support system for every farmer. It has an everlasting energy source in the form of a solar panel and works whenever the minimum of sunlight is available. The collected data is sent via LoRaWAN network to the FieldClimate platform, where it can be reached, with the help of a mobile app, from anywhere, anytime. The system is equipped with an auto cleaning mechanism which makes maintenance simple and fast. Everlasting energy source. Always within arm’s reach. Durable. All this, and more, is iMETOS LoRAIN. Save 247€ - First 1000 bought devices get one year free of charge service for diseases models’ calculation and localised weather forecast! Pessl Instruments team is looking forward meeting you at SIMA exhibition where you will learn everything about the new product.